The project is very helpful to the people of Swaziland especially as the world is faced with serious droughts and floods brought by climate change. Caritas implemented the project in the Lubombo region in Lubulini a community under the St. Philips Parish. The Lubombo region is the most affected by drought in the country and it is the same region that has the highest prevalence of HIV and AIDS, and T.B. cases. This community has a greater number of most vulnerable people and child-headed families or orphans who stay with their grannies. Interviewed families mentioned that they fetch water from long distances of +/- 3km. So, this is very difficult for the grannies and young children to walk. These families get water from neighbours. This exposes the families to danger, as one school girl narrated how she was rapped on her way to fetch water as she was from school in winter and she had to go and fetch water about 3km and it was dark when she met the man. The man is still in jail serving an 18 year sentence. The response from the families is overwhelming, as all of them said that this was a gift they never dream about having a tank. Three of the elderlies even cried thanking God and the Catholic Church for such a big gift to improve their lives. The children were also very happy as one of them said that although they are poor, without proper housing but now they are better because they have a tank something which some good looking homes do not have. One elderly even said that she now fears for her life from some community members who will be jealous for the gift. In one case, a Dlamini family most vulnerable only had 2 thatched houses which cannot harvest water by tank. 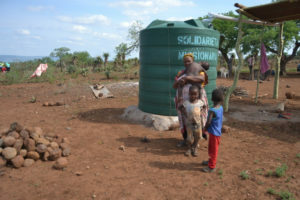 So, Caritas built a simple structure with iron sheets to harvest the water into the tank. The project budget was E31 400.00 yet the project needed E33 400.00, the Bishop’s office added E2 000.00. Fortunately, the families donated river sand and this reduced the cost by E600.00 which is the cost per load. We also realized that in the community there were granite stones to be used and are very good to replace concrete blocks. This also reduced the costs by E720.00. The initial budget was E33 502.00 but it went down to E32 502.00. All the beneficiaries are very happy, thank God and the Catholic Church for getting such wonderful friends. This was concurred by the community elders who also shared the same sentiments with the beneficiaries. The community has more than 2000 families. The project assessment reflects that about 2% of the community needs water tanks.